We haven't heard from the Queen of the Mbira in some time. She even put out a "Best of" compilation twenty years ago which usually signals a caesura in an artist's career. But I guess like all of us, she is aging, and taking it easy now she is in her 70s. I was doing pretty well myself until I knackered my lower back (an old complaint) last week. My sweetheart sent me an article which explained how bushmen in Tanzania, the Hazda, one of the last groups of hunter-gathers on earth stay fit because they are foraging for food and not sitting in front of a computer all day. I am not sure what their life expectancy is however, so I am not giving it all up to go to the Serengeti looking for nuts n berries and the odd spearable and roastable small critter (I can't even throw a tennis ball to scare the squirrel who tears up my plants). Bethatasitmay those East African tribes have deep spiritual roots connecting them to the earth and you sense that in ancient music, such as the mbira and rattles heard on this new gathering. If you are sitting in the smoke of a fire listening to this, it could put you in a trance and connect you to the spirits of those animals you long to encounter with your spear and flexible back. The Shona have played this mystical music for over a century, to call out to the spirits of birds, trees, water, even stones and send messages to the guardian spirits in all-night ceremonies. You might glimpse that here, in these eight brief tracks that were released as singles in pre-Mugabe Zimbabwe when it was Rhodesia. Interestingly the rituals associated with this music were forbidden but the recordings were made by Teal Record Co, however they did not actively promote them, so they are very obscure. The title track "Kasahwa" says innermost emotional pain is like a fishbone stuck in the throat. Chiweshe recorded it on a borrowed instrument since none of the instrument makers would make her an mbira. It was an immediate hit and secured her a place in the National Dance Company. Check out her single "Mayaya" here. No surprises but a pleasant set of classics from Mapfumo in this brief, 35-minute long CD. There's good sax, kicking drums, and humbucking guitar in the brittle thumb-piano style of mbira which characterizes his sound. Mapfumo is still immensely popular in his homeland Zimbabwe which is on the verge of total economic collapse. Their inflation is the highest in the world and life expectancy has halved to 34 years in just a decade. President Robert Mugabe went from a revolutionary hero to a pariah, but he's not unique in that regard. Just another tinpot dictator who lost the plot long ago. Not as bad as Bokassa or Idi Amin, but up there with Mobutu and other scum of recent memory. So what is there to sing about? The Chimurenga music that Mapfumo created was part of the revolutionary struggle, though his lyrics got him in trouble after the ZANU party came to power and he was jailed. He now lives in exile. These are oldies, mostly from the "Ndangariro" LP. His collection of hits THE CHIMURENGA SINGLES 1976-80 (Earthworks ELP2004) is excellent, and I am fond of his 1983 album MABASA (Earthworks ERT1007), as well as the reggae album he did with Misty & Roots, CHIMURENGA FOR JUSTICE (Rough Trade 91 1985), but there's a sameness to his albums and last year I purged my collection of a dozen albums. If you want just one of his discs, plump for this. 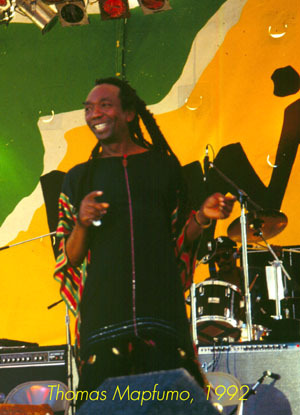 Thomas Mapfumo put on the best performance at the Live 8 concert, "Africa Calling," in July 2005. Admittedly he was up against some weak competition (Youssou aside), but he seems to have awoken from his long slumbers like Rip Van Winkle and put together a strong new album. The strife in his homeland is the impetus for the re-emergence of his protest voice. Robert Mugabe is a standout in the pantheon of stupid dictators in Africa, but short of a military coup nothing will stop his continuing murderous folly. But then things are so much worse in Sudan that Mugabe can probably get away with it for a bit longer. The opening cut had a bit more energy in the Live 8 show, but it is a smoky reggae/blues-tinged number, with one-drop drumming, soulful organ and even a jazz trumpet floating through. It is still recognizably Chimurenga music though, and in it he urges people to speak out. I am sure it goes over big in Zimbabwe. The Oregon boys on the album (I am conjecturing this from their names): Maurice McConnell on keyboards, Brooks Barnett on trumpet and Joe Manis on saxophone, add a nice sophisticated jazz touch to the traditional Zimbabwean thrust of the mbira-driven beat. Another weird & wonderful name for a band. This one a blend of musicians from different countries who were put together as the house band for a copper mine in 1972. 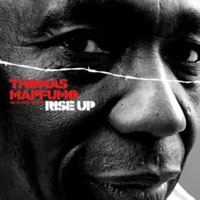 Young Zimbabwean pop singer Thomas Mapfumo was the drummer! The others were from Zambia, Malawi, and Mozambique and, as they were all professional musicians, were able to return to the mine and begin performing almost at once. However two of the band took part time jobs at a local chicken run to cover their living expenses. When he heard this, the manager exclaimed, "Hallelujah! Chicken Run!" The two would swipe chickens and eggs from their day job to feed their bandmates. When they played social gigs for whites they did covers of pop and soul songs but the miners wanted more traditional music and Mapfumo was happy to provide the songs he knew while the guitarist Joshua Hlomayi (of mixed Zimbabwean and Mozambiquean heritage) created the staccato dry guitar style with damped strings imitating the plucked patterns of the classical mbira which became the hallmark of this band and Mapfumo's later work. More than just the roots of Mapfumo, this album shows the evolution of the popular sound of Zimbabwean music in the hands of a group of very talented musicians. Like me, you may have heard enough from T Mapfumo. After his first ten LPs I got the feeling I was buying the same album over and over. 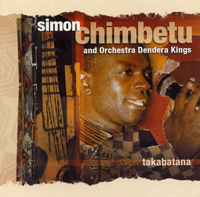 His Chimurenga Singles album is great, and I still dig MABASA and especially the album he did with Misty & Roots, but these early recordings are fresh and engaging. Last time I saw Mapfumo in concert I had a front row seat and was afraid he was going to fall off the stage and land on me. At a certain point (middle age?) many artists just coast along redoing their hits but their spontaneity dwindles and their creative edge dries up till they are just a cover version of their earlier self. This happens to everyone from Baaba Maal to the Who (who, apparently, have recreated their LIVE AT LEEDS gig, despite the fact they should have hung it up years ago -- without Moon & Entwhistle it can only be rubbish). But to get back to the point. Here is the start of a great sound and the interaction of some young talents on the verge of a breakthrough in politics as well as pop music (their politically charged lyrics emerged as Zimbabwe entered its final phase of liberation struggle). After the album ends there's a pause then a piece of ambient chat followed by a last song, which makes a nice coda. There's good sax and trumpet with the three guitars and busy percussion, and the sound restoration is top notch. Another gem, with thorough liner notes by Samy Ben Redjeb, vintage photos, and a mouth-watering package from the folks at Analog Africa. 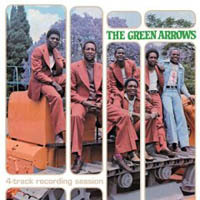 Zimbabwean pop band the Green Arrows are something of a legend, mainly because no one outside Zimbabwe got to hear them, till now. (One track appeared on Earthworks' 1988 compilation ZIMBABWE FRONTLINE.) After starting out as a rock cover band, they were persuaded to turn to traditional sounds and released their first album which sold 25,000 copies in 1976. They were the top band in the 1970s and this compilation lovingly and painstakingly reassembles their hit singles and the album, called CHIPO CHIROWA, which was the first LP record released in Rhodesia! There's a lot of acid-toned flanged guitar on the album, peaking on the track "Towering Inferno," which is so dated it is a bit ridiculous. (The fuzztone pedal was a gift from South African producer and musician West Nkosi who tried to sign the band to record for the Gallo label after being blown away by their live performance in 1974.) The lyrics are about the tallest building in the world catching fire (as seen in the popular movie of the title) while the melody is bubbly and fun. The second half of the CD picks up the band's singles which adhere more to the Chimurenga style based on likembe, familiar from the early work of Thomas Mapfumo, with an occasional sortie into more kwela-derived sounds. The liner notes (by Samy Ben Redjeb) are thorough, giving a complete history of the band with lots of photos and labels of 45s. We learn for example that the upbeat hit "Chechule wavale boton" is about a frog wearing tight bell-bottom trousers. (Band-leader, vocalist and bassist Zexie Manatsa was generally in a dagga haze when he wrote the lyrics for many of the songs.) The late seventies were the time of the independence struggles and the band concentrated on lyrics of liberation. Right now Zimbabwe is ripe for another war of liberation, and the Green Arrows are still performing so perhaps they will answer the call. When the album ends there's a silence and then the sound of crickets, and suddenly we are hearing an interview with Zexie and his wife, Stella. This reminds me, pleasantly, of the last cut on Balla et ses Balladins PAM CD "Reminiscin' in Tempo." Then it segues into "Wasara Wasara," another upbeat light number with which the band used to start their live shows. This release is exemplary in every way: the booklet is beautiful, the sound is clean, the music is uplifting. Let's hope there's more on the way from this new label. AFRICAN SUNSET is atypical Zimbabwean music, which makes a wonderful counterpoint to the "electrified mbira" sound of Thomas Mapfumo and Oliver Mtukudzi. The laid-back jazzy, soulful side of the music, which we might think makes it more akin to South Africans like Basil Koetzee and Abdullah Ibrahim predominates. Sax and a less-fierce drum-kit are muted by synth additions. In fact the slide into the great vocal style of Miriam Makeba or her countrywomen, the Mahotella Queens, by Dorothy Masuka with "Ngotsotsi," lends further credence to the South African influence on the changing music scene in Zimbabwe since independence. When the Bhundu Boys topped the UK Indie charts in 1987 with their album SHABINI, things looked bright for African music. Discafrique was putting out a succession of hip East African music with covers designed by Neville Brody. The band were on a roll, so when a Scottish fan told them they should come and conquer Britain they sold their equipment and bought plane tickets. The fan was a little surprised when he opened the door one morning to find five Zimbabweans ready to take him up on his offer of a place to stay. They did finally take the UK by storm, but only after starting over with menial jobs to buy new equipment and gigging in pubs. However by 1990 they were hot in Scotland and released the superb LIVE AT KING TUT'S WAH WAH HUT. The last cut on that album, "Bye Bye" was ominous since the band members were all HIV positive and shortly after this swan song, they were no more. It's a sad tale but there was a bright beginning: those long days at Shed Studios in Harare when the quintet laid down their hearts and souls on reel-to-reel tape. BHUNDU BOYS THE SHED SESSIONS (Sadza Records, Germany) is a lovingly packaged double-disc presentation of the complete Shed recordings, in chronological order, with extended versions and 6 tracks never before released outside Zimbabwe. Though I have two-thirds of the tracks, on their first EP, and the albums SHABINI and the sequel TSVIMBODZEMOTO, I feel a real sense of joy in hearing these songs again and re-discovering the exhilaration of the interplay between the instruments. This band really smoked! 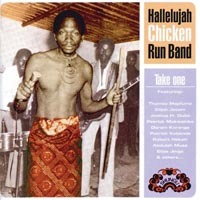 They can go from light ballads with shekere backing an acoustic guitar, and congas, to a full-blown rock blaze with flangers on guitars and high-hat, popping bass, and the inimitable African mi-solo guitar dropping back to the chicken scratch bridge where you know everything is about to explode. The excitement of the old A-side song followed by B-side rave-up is palpable. The band was formed soon after Robert Mugabe led Zimbabwe to independence in 1980 and the fervor of that time is evident in the music, which, like the Chimurenga music of Mapfumo, is based on mbira patterns, though you can detect other influences like country & western, as well as Zairean and Zulu ("Chimanimani") flavors to some numbers. The musicians all cut their chops in bar bands with covers of Otis, Hendrix, Led Zep, Bad Company, Thin Lizzy, and on down the line. But now Zimbabwe was a free country and bands could make their own music. The Bhundu Boys took their name as a wry comment on guerillas who lived in the bush. ("Bhundu" is Kiswaheli for outback; boondocks is the Tagalog word for really remote mountain back-country from the other side of the Indian Ocean. I don't know if there's a semantic connection.) Over the four years that these recordings were made the band evolved. Original guitarist Shakespeare Kangwena returned but had to learn keyboard as his slot had been taken by the incredible Biggie Tembo. The drummer was replaced and there was a succession of bass players, ending up with David Mankaba (an Ndebele; the others are all from the Shona tribe) whose funkier style of bass enlivens the last few tracks. It's a treat to go back in time and hear these Shed Sessions again. If you have the Discafrique albums, give them a spin for old time's sake, if not, you'll want this bargain-priced extended set for a big piece in the mosaic of East African popular music. This is Zimbabwean music that manages to escape the influence of Mapfumo and Mtukudzi, having instead a rhumba flavour to it, and more in common with its northern neighbours in the Swaheli belt of East Africa. Dendera Kings remind me of Marxist Brothers and Bhundu Boys, those classic bands from the 70s and 80s, with their full-tilt buoyancy. A web search turns up little info about the band, but in fact it does tell me that Simon and his brothers were founders of Marxist Brothers. After that band broke up in the early 90s, Dendera Kings were formed. Their name doesn't come from the Temple of Hathor in Dendera, near Luxor in Egypt, but from a refugee camp in Mozambique where they lived during the fight for Independence in Rhodesia. Simon is in favor of the land grabs but rumour has it that his farm hands have not been paid. So the struggle goes on. (A recent New York Times story talked about the white farmers who have been displaced and have moved to neighbouring countries: in many cases their farm hands have followed them to seek work as they don't have the experience or skills to run the liberated farms in Zimbabwe). It's hard to separate the music from the politics with what is going on in Zimbabwe right now, but Dendera Kings are part of an older generation that are falling from favour there. Their music still appeals to me. It's light and bright and the guitar interplay takes it down to the bare bones of snare drum and hi-hat as the guitarists drop out then return, one riffing stably with his Boss (TM) Flanger turned to that warbly twanging metallic setting while the other comes back soloing in counterpoint. Samplers are a great way to pick your way through the minefield of pricy imported music. The second volume of THE INDESTRUCTIBLE BEAT OF SOWETO, for example, follows the first in both artists and cuts so you get a premonition of how each track will start. It echoes the original compilation so closely, in fact, that it might have been called the Indestructible B Sides. A companion to the first is nevertheless a welcome addition. The problem (if there is one) with these sequels to last year's TAKE COVER is that the prequel set such a high standard. Not so GOODBYE SANDRA, the "official" volume two of TAKE COVER. Here we have a whole new selection of top artists from the country that musically occupies the spot between the fast dueling guitar sound of Zaire, and the Gospel-inflected choral music of South Africa. While I'm sorry not to hear more of Jairos Jiri Sunrise Kwela Band (which is apparently made up of handicapped musicians), I'm pleased to encounter the Marxist Brothers and the Sungura Boys. Apart from the devilishly slick guitar work and impassioned singing of the Marxists and Sungura Boys, the album presents old-timer Oliver Mutukudzi. An added bonus is that a couple of the songs are in English (not surprising when you consider that when most of these musicians were kids, they were "Rhodesians" and were punished for speaking anything but English in school). To present diversity, the producers have added two tracks by John Kazadi -- the opening and closing numbers -- but these are truly awful, and the numbingly bad musicianship is heightened by the "authentic cassette quality" of the recording. Apparently some of the original tapes were lost. Some traditional music doesn't change much and we are to assume the practitioners and aficionados like it that way. Though the Brits outlawed the mbira in East Africa a generation ago, today white people are going there to study the instrument. PASI MUPINDU ("The world is changing") by the Mhembero Mbira Ensemble is a classic thumb piano recording immediately identifiable as Zimbabwean Shona music. The members of the Chigamba family play Shona melodies while the hosho adds the threshing sound of a shaker. This traditional Shona mbira group plays all-night bira ceremonies where the music, grounded in the plaintive voice of the singer and muttered assent of the chorus, is used to call up ancestral spirits and get guidance in family affairs and community matters. You get a time-suspended trance in the sleepy drone of the music. It's great late-night music to read or work to. You feel the crackle of the fire and the sussuration of insects in the bush. 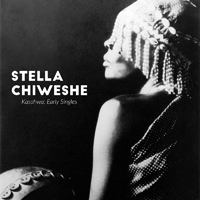 The Mbira Queen, Stella Chiweshe, has put out her first album in seven years and it's a gem. Chiweshe is a shamaness from Zimbabwe; her music is calculated to put you in a trance and bring forth the spirits, and it does. Back in the late 80s she rose above the run-of-the-mill thumb piano bands coming out of East Africa by recording in London with the Three Mustaphas (remember those crazy cats?). She also did a session for John Peel (England's most consistently innovative and interesting DJ, whom I idolized in his Radio Caroline days) that was heavy on the dub effects: pumping bass and the ever-reliable Roland Space Echo maxxed on reverb. Her classic cut with the Mustaphas, "Chachimurenga" (from AMBUYA? On the Earthworks label, 1987) is included here and reminds us of how trippy she sounded. Interestingly she still holds up after 15 years. The speeded-up music box quality of her thumb-piano picking resonates deeply as her unearthly cracked voice tells of spirits lurking in the bush beyond the firelight. Yet the bass thud is there to keep you grounded. This is soulful music which undoubtedly has curative powers beyond its ability to soothe you. The trend to "varied artists" on the Earthworks series of releases this last year is a promising one that can't fail. The sensational HEARTBEAT SOUKOUS, and RAI REBELS both finished high, if not Highly. More Varied Artists constitute ZIMBABWE FRONTLINE which starts judiciously with the familiar flanged guitar of Thomas Mapfumo and the scorching "Pidigori." But the energy only increases from there. Oliver Mutukudzi, another of the older stars, appears along with Mapfumo, the Four Brothers, plus the great Jonah Moyo and Devera Ngwena. Zexie Manasa and the Green Arrows introduce a thumb-piano or mbira into their song and the influence of this instrument in evident throughout in the light finger-picked style of the guitar-work. The drumming is light but relentless, featuring a lot of double-tempo on the cymbals. The singing is infectious and often impassioned. Altogether the ZIMBABWE FRONTLINE album builds to a forceful conclusion. The singers of liberation include Susan Mapfumo -- no relation to Thomas -- a rare female artist in Zimbabwe who sings of female independence (lyrics are translated on the sleeve). Robson Banda and the New Black Eagles have a joyful, infectious number where they urge everyone to join them in singing. The album ends with the outstanding "Taxi Driver" by Jonah Moyo and Devera Ngwena. The vocals are harsher -- like Swaheli singers -- especially the hilarious fake falsetto female voice nagging the Taxi Driver for information about her unfaithful husband. During the bridge the car horns will have you looking out the window and for a moment, the music really transports you. Thomas Mapfumo was born in Marondera, Zimbabwe on 2nd July 1945. During the early seventies he sang in a number of groups that emulated American-style gospel singing. Under white rule, Zimbabwean music was influenced by Western pop as much as by African music. South Africa had the only organized recording industry in the southern part of the continent, and the "mbaqanga" music of groups like the Mahotella Queens was adapted into Zimbabwean music as "simanje-manje." Rumba was imported by Zairean bands, some of whom took up residence in Zimbabwe and began singing in Shona. Mapfumo translated some foreign pop songs into Shona but soon forged his own style of music, basing it on traditional mbira or thumb-piano rhythms. Although this was contrary to the slick Westernized style performed by most Zimababwean bands, the mbira-based music, coupled with revolutionary lyrics, swept the nation. During the bitter war of independence, Mapfumo had to couch his message in ambiguous terms. Nevertheless he was persecuted and in 1977 jailed for three months for sedition. 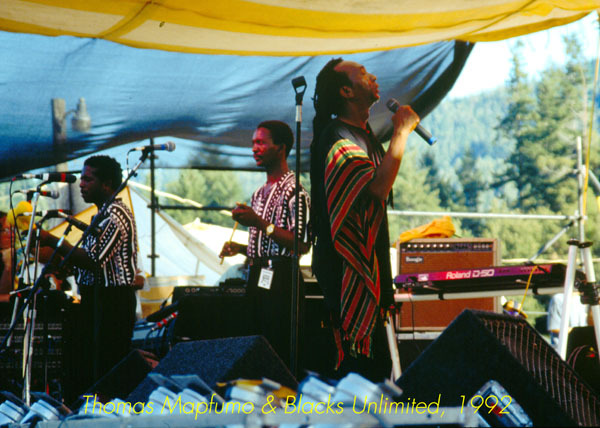 Since Zimbabwean independence in 1980, Mapfumo and his band, the Blacks Unlimited, have toured Europe and had increasing successes at home in Harare, remaining the top performing band in Zimbabwe, Mozambique, Malawi and Zambia. I spoke to him by phone from Lincoln, Nebraska. DR: It's been four years since your album Chimurenga for Justice came out. Can we expect a new album soon? Mapfumo: Yeah, we have one which is going to be released by Island here. The title is Corruption. Back at home it's now on the market and it has a different title: The Poor to the Poor. Before this one that we're talking about we have actually recorded other music, we have another album by the name Zimbabwe/Mozambique. DR: That was only released in Zimbabwe? Mapfumo: Yeah. In Zimbabwe we are independent and we actually run all the works, like paying for the pressing, for our distribution, and the label, everything. So we actually take care of the business also. We have what you call a fat cat deal with people from Gramma records. DR: You decided to release it yourself, or you couldn't get a foreign distributor? Mapfumo: Well, we gave it to someone in the UK to try the music but it seems that someone didn't get interested. What surprised us when we were still convinced the album was a good album, we had people from Gramma records send about 500 copies to England to try and sell the LP and it was sold out in one day. That proved the music was good. But this someone didn't take any interest. We still hope eventually to release it abroad. DR: Your last album, CHIMURENGA FOR JUSTICE, was much more commercial, almost a reggae album, than your previous albums which were more traditional. Is that the sound you've adopted, or was it just for that one album? Mapfumo: It was just for that one album. Right now, the one we're talking about is full of real traditional music of the people of Zimbabwe. DR: Well, what made your music so distinctive in the first place was how original and different it was. Back in the seventies you started out with American-style bands doing gospel and soul. DR: At what point did you decide to incorporate the mbira rhythms into your music? Mapfumo: You know you actually have just mentioned that I was into Western style music playing copyright music and I was also playing rumba music from Zaire and some other African sounds. But you know, as I matured I started thinking about myself. I was coming to the reality that, you know, I was chasing after rainbows. I was supposed to be called Thomas Mapfumo, somebody who has got his own thing. 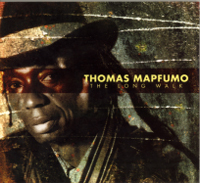 I mean, to be called Thomas Mapfumo I had to look around for a sound that could suit my people back at home. When I listened to mbira rhythms I found out that music was danceable. I grew up in the communal lands, I was a head boy, and I grew up listening to that type of music a lot and so actually when I listened to it for the second time, this time I was a matured boy, someone who could tell the difference between good and bad. The only thing that wanted to be done with the music was to make it appeal to the modern world. Someone was supposed to have done that but then I was meant to do it. When I started to do this music maybe a lot of people thought I was just going astray, because they didn't think that the Shona language was actually suitable for lyrics. I convinced them that the music was theirs, was their culture. Mostly what helped was the liberation struggle. At the time I started this music was when the war broke out in Rhodesia (as Zimbabwe was known at that time). The people began to think about themselves, who they were, where they came from, what they were supposed to be called, and they started listening to my music on the radio. It gave them what we call moral support. I wanted to fight back the oppressors. In the music everything was going smoothly. People were now running away from the Western world, and coming back to their own culture. But then I got into problems because I was arrested for that. They said my music was political, and I kept saying it was the traditional music of the people of Zimbabwe and the music was part and parcel of their culture. They sent a lot of Special Branch men to question me. I kept saying the same thing until at last they decided to release me on condition that I had to go to Bulawayo to play for Bishop Muzorewa's rally for the Internal Settlement. When I was released I met up with the other members of the Blacks Unlimited and we had a meeting to discuss this thing of going to Bulawayo for the Internal Settlement. We were helping the guerillas fighting the liberation struggle, we were the voice of the people, those who were not armed. I tried to convince my colleagues that we should go to Bulawayo and play for this rally although we didn't believe in the Internal Settlement. But they were afraid to do that because of the guerillas. They were afraid that if this concert for Muzorewa's rally was going to be heard by the guerillas there would be trouble for us. So I said to them, The guerillas know we are not armed ourselves, the only way to defend is to go to Bulawayo and play for this rally. But when we get there we are not going to support the rally as such, we have our own music, our Chimurenga music to look after. And so we went to Bulawayo and we played the rally and the music we played was "Hail Chimurenga." The other people there asked why we were still playing this type of music when the country was about to retain its independence. I said, this day I was in detention myself and I composed this type of music to suit the situation. They understood, and the best thing that happened was the next day the paper ran a picture of myself and Bishop Muzorewa on the front page. That was victimization, but then we didn't worry about that. We carried on playing the same music and a lot of things were said about the Blacks Unlimited and Thomas Mapfumo. Some of them said we had sold out, but we never answered back, we kept on playing the very same music that supported the struggle. We were still the band of the people although some of them were being led astray by those who were preaching the wrong things to them, but in the end people realized we were the only band that fully supported the struggle, and today we have all the people in Zimbabwe behind us. DR: Since Independence have the conditions for musicians in Zimbabwe changed? I know that under the Smith regime the situation was that a nightclub owner would own the equipment and hire the band on a wage. Does that still happen? Mapfumo: That is still happening, but the most interesting thing in Zimbabwe today, when you get to Zimbabwe you find that since myself and those few musicians of those days during the liberation struggle -- there were very few bands during the liberation struggle -- right now we're talking of over a thousand bands and all those bands are trying to do their own thing, they have their own music -- African music -- and they are playing and recording a lot of stuff. It's an achievement, especially for the Blacks Unlimited because they are the pioneers. And today we have so many bands in Zimbabwe: it's because of the Blacks Unlimited. DR: I wanted to ask you also about the present tour. Is this your first visit to the US? Mapfumo: I came one time before on my own to promote my music. DR: You're touring with Sekou Diabaté and Bembeya Jazz from West Africa. Is that having any impact on your own band? DR: You haven't been jamming? DR: This is more of a cultural tour, where you're playing sit-down concerts at universities. Does that affect your music as opposed to when you play a dance at a nightclub? Mapfumo: Of course, because this type of music that we play is for people to dance to. We don't mind playing where people are seated, we are still good at that because we are also used to playing such concerts. But then we actually would like to play for those who like to get on the floor and start dancing and so we tease with our music. DR: Are you planning to play any dance or nightclub gigs while you are here? DR: I read in your interview with Fred Zindi, where he asked you about your dreadlocks and other characteristics that reminded him of Rastafarianism, and you said you were not actually a Rastafarian and you felt the Jamaicans were taking a style from Africa. Mapfumo: If you listen to Rastas, what they say, when they talk about Africa, is Africa is their home, that's where they came from. To say that dreadlocks is a Jamaican thing would be to be going astray because this is an African thing and has been in Africa since the world began and we have a lot of our people wearing dreadlocks, we have some ordinary people wearing them. In places like Kenya or Uganda, the Masaai people wear dreadlocks. It's being popularized by Jamaicans but it's still an African thing. DR: Are young people who wear dreadlocks considered rebellious by older society? Mapfumo: Some people don't like people who wear dreadlocks; others think that dreadlocks are dirty, but dreadlocks are not dirty if they are looked after: it's like any hairstyle that we see people are wearing, you have to clean them and look after them. If you clean your dreadlocks what's wrong about that? DR: Are you getting the same kind of reception here that you have been getting in Europe? I know for about five years you've been playing sold out concerts in London and Amsterdam. Mapfumo: Oh yeah, we are getting that. DR: The American audience is a lot slower in picking up on non-English music. Mapfumo: This type of music is danceable and it doesn't take long for one to get on the floor. The moment you hear this kind of music you just feel that you wanna dance. DR: Do you think the big trend towards African music in the West is because of the failure of Western pop music? Mapfumo: Of course. But you know we've seen there are a lot of different kinds of sounds and beats in African music. In Western pop, rock and roll has been played for years and years and it's still the same songs being repeated. Now in African music we don't play that. If a dance is popular, a year later there's a different style. DR: It's evolving in more ways. Which bands do you personally like, either African or Western, that you are listening to lately. Mapfumo: Bob Marley, Bunny Wailer and Peter Tosh. Mapfumo: Even here in America, black groups are good. But we have people like Frank Sinatra who is a very good jazz man. We have black artists like Chicago Transit Authority who are playing funky jazz, we also like bands like Blood, Sweat and Tears. I like that brass section, it's very good. And of course, Michael Jackson, Lionel Ritchie and the rest of the funky bands, like the Commodores, and the girls like Diana Ross and the rest of them, their music is still good, because in Africa they are also popular, people like their music. My own kid likes Michael Jackson: I cannot stop him! It's his own choice. But I like especially the reggae world, and respect artists like Bob Marley and Dennis Brown, because they are preaching peace, they are spirited, they are positive, they are telling the truth about what's really happening in this world. There are a lot of rich people in this world who exploit the poor. There are a lot of people still suffering from hunger and yet one man can buy a car worth $350,000. Just a car! The whole thing is written off and we don't talk about it any more, all the money is gone. But if we had given that money to the poor souls who are sleeping in the streets or maybe trying to find them shelter, a place to sleep, something to eat, you would have done much better. DR: Your lyrics are still controversial. Are you getting any trouble at home for your songs? Mapfumo: I don't worry about it. DR: I'm looking forward very much to hearing you in Berkeley.